The above picture is a local girl’s school group visit to START. 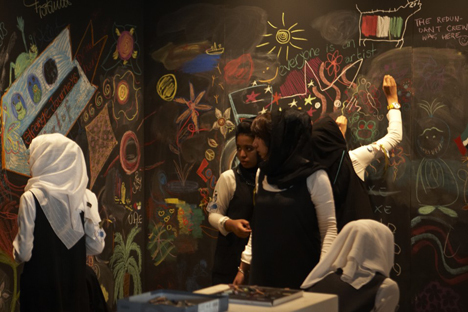 A large blackboard was set up in this workshop to be transformed into a work of art by students. From appearances, the students were quiet and serious while working on the project. In their each individual way, they were devoted to learning how to perfect their art. Among 400 artists, there were many emerging artists, especially from Korea and China, with eye-catching pieces in this year’s Art Dubai. 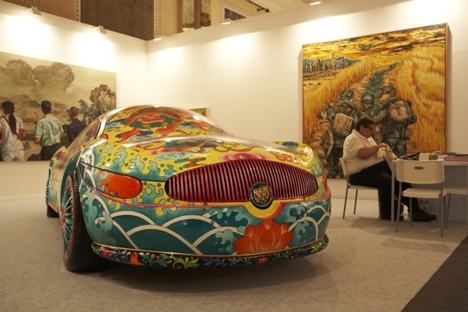 ‘The Car’ by Chinese artist Ma Jun is a car covered with vivid Oriental painting. 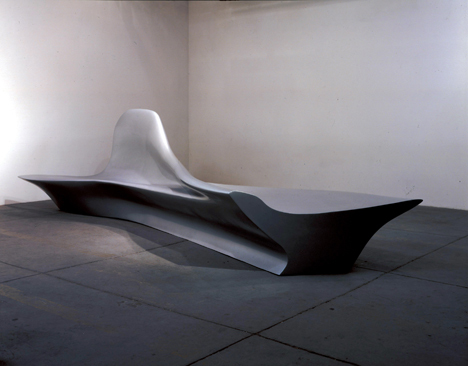 In the Max Protetch gallery from New York, you would be astonished to see a very striking installation called ‘Bench’ by Zaha Hadid. Among other projects, the world famous Iraqi artist has designed Abu Dhabi’s Saadiyat Island Opera house to be completed in 2012. Dubai’s local gallery, ‘The third line’ is famous for wide collection of local artists from the region. As a popular haunt for local art fans, this gallery welcomed many visitors with original and creative pieces. Youssef Nabil’s ‘Self-portrait with Laila Elwy’ has sparkling element.